Molecular quantum-dot cellular automata (mQCA) has received considerable attention in nanoscience. Unlike the current-based molecular switches, where the digital data is represented by the on/off states of the switches, in mQCA devices, binary information is encoded in charge configuration within molecular redox centers. The mQCA paradigm allows high device density and ultra-low power consumption. Digital mQCA gates are the building blocks of circuits in this paradigm. Design and analysis of these gates require quantum chemical calculations, which are demanding in computer time and memory. Therefore, developing simple models to probe mQCA gates is of paramount importance. We derive a semi-classical model to study the steady-state output polarization of mQCA multidriver gates, directly from the two-state approximation in electron transfer theory. The accuracy and validity of this model are analyzed using full quantum chemistry calculations. A complete set of logic gates, including inverters and minority voters, are implemented to provide an appropriate test bench in the two-dot mQCA regime. We also briefly discuss how the QCADesigner tool could find its application in simulation of mQCA devices. Recent advances in molecular electronics on one hand and the limitations of conventional semiconductor devices, on the other hand, have driven a surge of activities towards the realization of molecular devices, circuits, and systems. Achieving the ultimate diminution in size, power consumption, and delay of electronic devices and systems has always been a challenging endeavor of scientists and designers in this field. Due to the prospect of size reduction in electronics offered by molecular-level control of properties, molecular electronics provides means to extend the Moore's law beyond the foreseen limits of small-scale conventional silicon integrated circuits. 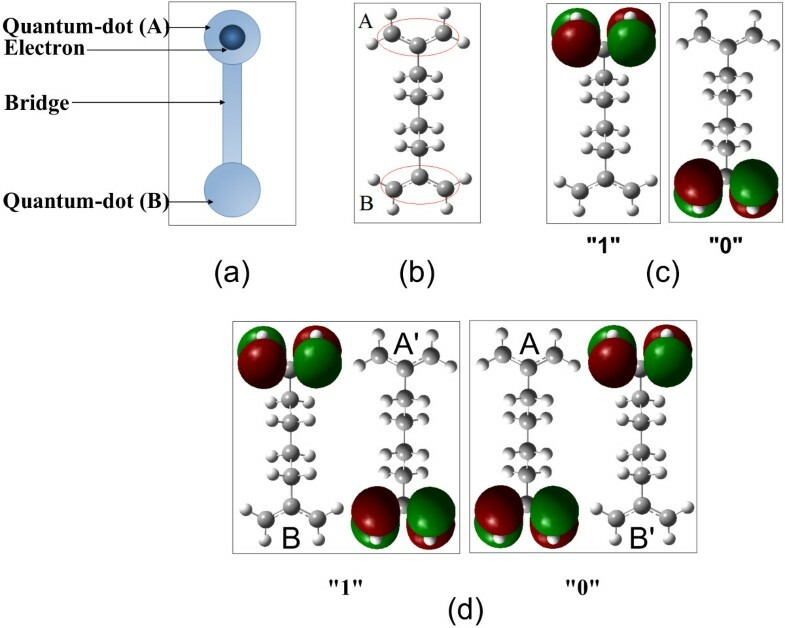 The small size of molecules allows high device density in the range of 1011 to 1012 devices/cm2. Besides, the chemical self-assembly capacity in manufacturing molecular devices provides many advantages to conventional semiconductor manufacturing technology, including lower manufacturing cost and uniform device reproducibility. Molecular electronics endeavors to use the nonlinear current–voltage characteristics of individual molecules or molecular assemblies as active devices (diodes, transistors, etc.) in electronic circuits. However, the power consumption of molecular current switches at very high frequencies is still a drawback . The π-σ-π mixed-valence type molecules, which provide double-well potentials for electrons, have been proposed and studied by Aviram towards the synthesis of memory, logic, and amplification . Lent proposed using molecules in representing binary information within the molecular quantum-dot cellular automata (mQCA) paradigm [1, 4]. Molecular QCA provides an alternative approach to represent and process data, where binary representation lies in the charge configuration within molecules rather than in the on/off states of current switches. A cell in the mQCA model consists of a number of molecular quantum dots (or redox centers) and a few electrons. The electrons tend to occupy antipodal sites as a result of Coulomb repulsion. The Columbic interactions cause electrons to tunnel from one redox center to another in a cell, but not between cells. Thus, it is likely that no current flows, since the neighboring cells are coupled by electrostatic field. 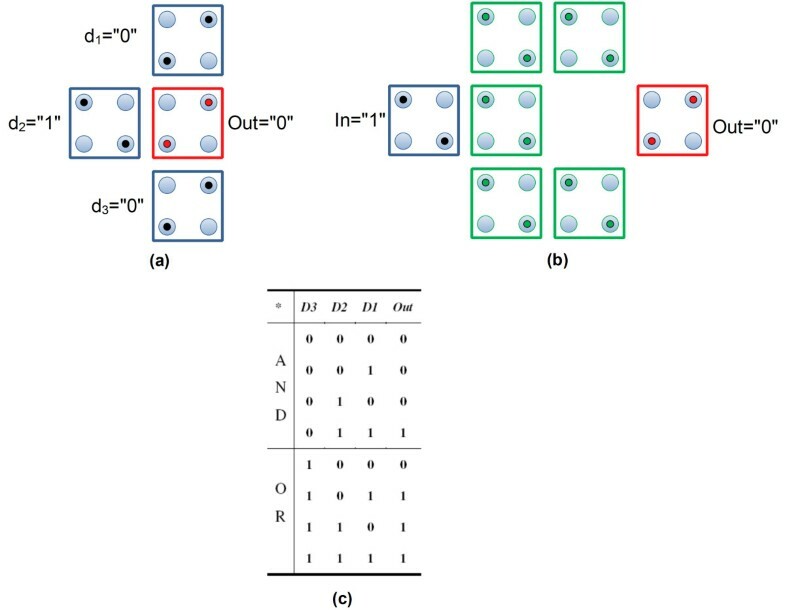 Figure 1 depicts two-dot and four-dot mQCA cells and how binary “1” or “0” is represented. The first QCA device was implemented and tested using metal dots at near 0 K . Semiconductor implementation of QCA using GaAs/AlGaAs heterostructure materials has been reported in [6, 7] as well. Molecules are good containers for keeping electric charge and mQCA cells have a more promising future to work at room temperature . Nonbonding π or d orbitals of a single molecule (or multiple molecules) can function as quantum dots, where the electric charge is localized in each cell. Synthesis of two-dot and four-dot mixed-valence candidate molecules for mQCA has been reported in [9–14]. Many of these molecules are mixed-valence type and include transition metals to enable fast electron transfer reactions . Molecular QCA gates are the building blocks of circuits in this paradigm. Calculation of the electronic structure of mQCA gates composed of these molecules is challenging, since the number of basis set functions grows exponentially as the number of molecules and atoms are increased. Besides, many of the ab initio methods fail in describing charge distribution in mixed-valence complexes. Therefore, developing semi-classical models to study mQCA gates is of high importance. Currently QCADesigner  utilizes nonlinear and two-state approximations to solve metallic-based QCA circuits. Several QCA circuits including combinational as well as sequential circuits have been studied using QCADesigner. Examples are adders, shift registers, RAM, digital data storage, and simple microprocessors [17–26]. In this paper, we center on two-dot mQCA and analyze the validity and accuracy of the two-state model approximation for studying multidriver mQCA gates. This study provides an approach to enhance the QCADesigner tool for simulation of mQCA devices in the future. Binary representation in the mQCA paradigm. (a) Schematic structure of a two-dot mQCA cell. (b) A two-dot molecule. (c) In two-dot cells, depending on which of the upper (A) or lower (B) quantum-dot is occupied, binary “1” or “0” is represented. (d) In four-dot cells, binary “1” and “0” is represented within the occupation of AB’ or A’B dots correspondingly. The majority voter (MV) and the inverter (INV) gates  are the fundamental building blocks of any circuit in the four-dot QCA architecture. These gates have been schematically shown in Figure 2a, b. Particularly, the MV gate is referred to as the universal QCA gate, since the AND and OR logical operations can be done by this gate, as evident from the truth table shown in Figure 2c. Four-dot QCA gates. (a) The universal MV gate. The majority of the three fixed inputs, which is “0” in this figure, appears at the output as a result of Coulombic interactions and minimum energetics. (b) The inverter gate. (c) Truth table of the MV gate. When d3 = ”0”, the MV gate performs AND logical operations on d1 and d2, and when d3 = ”1” the MV gate functions as a two-input OR gate . Our multidriver minority voter (MinV) gate is composed of m drivers, where m is an odd number, as inputs and one output. Figure 3a schematically illustrates the three-driver MinV model gate in the two-dot mQCA regime. When only one driver (e.g., the d 1 ) is present, the model gate serves as an INV gate (Figure 3b). In the multidriver MinV model gate, all the distances between the centers of the molecules are l, which is equal to the distance between the middle of upper and lower π-bonds as shown in Figure 3c. The inputs of the gates are kept fixed, while the output cells switch to their stable states. To this end, two point charges q and 1-q separated by distance l are used to mimic each input as depicted in Figure 3c. Two-dot QCA gates. (a) Structure of the three-input MinV gate. This gate is composed of three fixed inputs (d1, d2, and d3) and a two-dot molecule (AB) as output. The minority of the three fixed inputs, which is “0” in this figure, appears at the output. (b) When there is only one input, the MinV gate functions as an inverter gate. (c) Two point charges q and 1-q separated by distance l, which is the distance between the middle of upper and lower π-bonds, are used to mimic a fixed input. (d) Truth table of the MinV gate. When d3 = ”0”, the MinV gate performs NAND logical operation on d1 and d2, and when d3 = ”1” the MinV gate functions as a two-input NOR gate. The MinV gate is an alternative to the MV gate in the four-dot QCA, where the output is inverted. Compared to MV and INV gates in the four-dot architecture, which require 16 and 28 quantum-dots correspondingly, the MinV and INV gates require only 8 and 4 quantum-dots in the two-dot mQCA regime. Consequently, these gates provide a small two-dot mQCA test bench, which make high level quantum chemical calculations feasible. 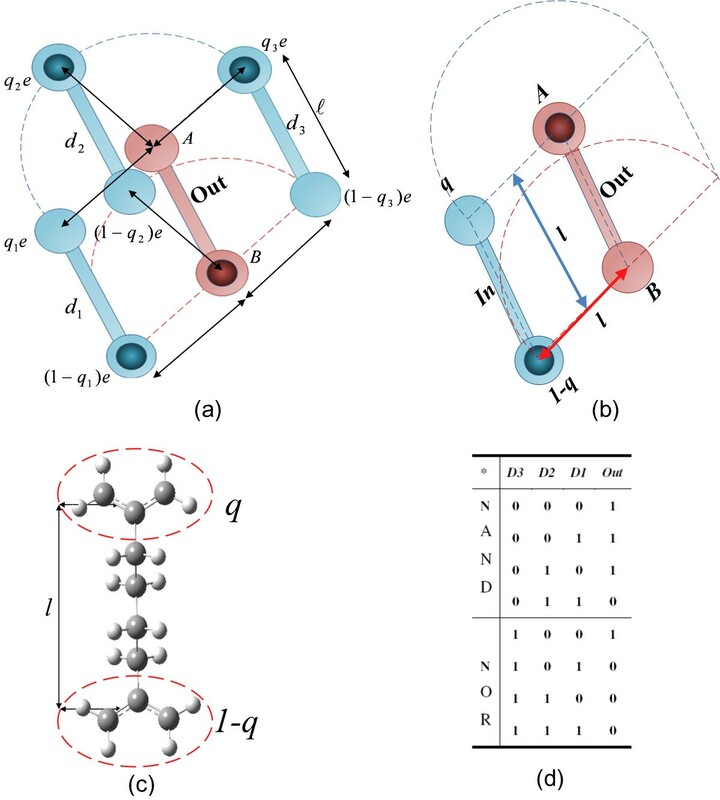 The MinV gate can perform NAND and NOR logical operations, as shown in Figure 3d, and provides a functionally complete logic set to implement any logic function in the two-dot mQCA framework. Additionally, it is possible to implement multi-input (or multidriver) MinV gates, which in turn decrease the total number of gates required to implement a logic circuit. It is important to note that since the MinV gate is not a planar gate, circuits implemented in the two-dot mQCA regime are not planar circuits. We highlight that the practical QCA circuits require clocked-control cells and clocking schemes [21, 27–29], which are not addressed in this paper. where E′ i,j and E i,j denote the electrostatic energy of cells i and j having opposite and same polarizations correspondingly. where P— j is the sum of the polarizations of the neighboring four-dot QCA cells. Equation 7 is currently used in the nonlinear and two-state simulation engine of QCADesigner to solve the metallic-based QCA circuits. It is important to note that mQCA utilizes non-abrupt clocking to reduce the probability of Kink, the property that is not currently present in the QCADesigner as it is based on metallic QCA. In mQCA, the tunneling barriers can be controlled by external electric field . It is demanding to enhance the tool to be able to simulate mQCA circuits. As a primary step towards this end, we present how a similar equation to (7) can be derived directly from the two-state approximation in electron transfer theory [34, 35] for two-dot mQCA. We then discuss how these approximations affect the results compared to those obtained from full quantum chemistry calculations. Equation 8 describes the electron transfer (ET) process in a two-dot mQCA cell, where the two redox centers, A and B, are linked through an intervening bridge, I. The additivity relation in Equation 20 originates from the additivity of electrostatic potential energy in Equation 13 for diabatic states. a b = a ! b ! ( a − b ) ! We present full quantum chemistry calculations of the steady-state output polarization of the universal MinV model gate serving as INV and three-input MinV gates. The results based on full quantum chemical calculations are compared to the results obtained from the TSM. The π-σ-π mixed-valence type molecules, descended from Aviram's original idea are analyzed. These molecules include 1, 6-heptadiene, 1, 8-nonadiene, and 1, 4-diallyl butane radical cations, which will be referred to as molecule 1, molecule 2, and molecule 3 in this paper, respectively (Figure 4). We optimized the geometry of these monocations using the DFT/B3LYP method. The dot-dot distance, l, in these molecules is between 0.5 to 0.8 Å. Bistability and electron localizability of these molecules have been studied in [3, 46, 49]. Geometry of the molecules we used in our calculations. 1, 6-heptadiene, 1, 8-nonadiene, and 1, 4-diallyl butane radical monocations from left to right. In the first two molecules, coordinates of the three highlighted atoms have been set to xy plane, while the coordinates of the central carbon have been set to origin. For 1, 4-diallyl butane, the origin has been set in the middle of the bond between the two central carbon atoms. The state-averaged CASSCF (SA/CASSCF) method  can be used to calculate the electronic coupling element of asymmetric molecules. One can obtain H ab by calculating the energies of the ground and first excited states and use them in Equation 26 within the two-state approximation. We have calculated the electronic coupling elements using both methods. The calculations for molecule 1 and 2 were based on SA/CASSCF(34), and the calculations for molecule 3 were based on SA/CASSCF(56). In 1, 4-diallyl butane cation, the allyl π-bonds are aromatic, and the active space is extended to five electrons in six orbitals. The calculated ET matrix elements have been compiled in Table 1. The Kink energies of the molecules have also been calculated using Equation 15. Table 1 includes all required parameters of the TSM. All calculations reported here were performed in Gaussian 09 , using 6-31 G(d) basis set. Various basis sets have been extensively tested to examine the basis set dependency of the results. Application of larger basis sets did not significantly influence the energy difference between the ground state and the first excited state. The results from the two methods are in good agreement. The ET matrix element, H ab decays exponentially with dot-dot distance, l. The dot-dot distance for molecule 3 is less than that of molecule 2; however, the H ab has been remarkably decreased. This is due to the symmetry of this molecule and the aromatic bonds of the radical allyls. The geometrical parameter, l, and the type of head groups, play an important role in determining the ET matrix element. To obtain a more accurate electronic coupling element, the overlap integral, S ab , should be taken into account as described in the work of Farazdel et al . Aviram  has obtained a negligible overlap integral for molecule 3 with dot-dot distance of 7 Å. In mQCA, the electron transfer drama should have a little effect on the geometric parameters . Consequently, candidate molecules should possess fast electron transfer reactions, and the relaxation of nuclear degrees of freedom can be ignored. Table 1 also lists the changes in the head groups' π-bonds (Δζ) as a consequence of ET reactions. It is seen that ET reactions in molecule 3 should be faster compared to the other two molecules. 1 H ab has been calculated based on the Koopmans' theorem and DFT/B3LYP method. 2 H ab has been calculated based on the SA/CASSCF method. 3Calculations have been done based on CASSCF method. When there is a single driver, the change in the sign of the input will result in a change in the sign of output polarization. The negative inputs have been omitted to reduce the size of the table. Po and Po * denote the calculated output polarizations based on the SA/CASSCF and TSM methods respectively. RMSE* represents the root mean square errors of P o and P o * . Equation 30 shows that the saturation polarization of the output increases with the increase of μ. This is also evident from the results in Table 2. In the model MinV gate, the number of input drivers (m) should be odd. No logic operation is performed when m is even. However, neglecting the logic, the two-driver device is an appropriate small model system for studying the additivity relation, and how the accuracy of the TSM is influenced by the number of drivers. Here, the MinV gate is probed when only the two input drivers d 1 and d 3 are present (Figure 3a). We have calculated the normalized dipole moments of the gates' outputs based on the SA/CASSCF calculations. The output polarizations have also been calculated by the TSM. The results obtained from the two methods are compiled in Table 3, which are in good agreement. The conclusions from analysis of the INV gates can be extrapolated to two-driver devices as well. Compared to INV gates, the increase in the RMSE of the two-driver devices, composed of molecule 1 or 2, is mainly attributed to the asymmetric head groups. In other words, the effect of d1 on the head groups is different from that of d3, where P d1 = P d3 . In molecule 3, the allyl head groups are symmetric, and the TSM error mainly arises from the classical approximation of the intercellular interactions. It is important to note that the output polarization of the two-driver devices can be calculated by employing the additivity relation on the output polarizations of the INV gates. The additivity relation has been validated for the SA/CASSCF method as well. Through full quantum chemistry calculations, the output polarizations of the two-driver devices were obtained. We also used the results of the INV gates, P(P d1 + P d2 ) from Table 2, to examine the additivity relation for SA/CASSCF method. As expected, RMSE is highly dependent on the symmetry of the head groups. Unlike molecule 1 and 2, for the case of molecule 3, each driver has an exactly same effect on the head allyl groups, which leads to smaller RMSE. We also highlight that employing additivity relation decreases the computational cost of SA/CASSCF calculations. Table 2 and Table 3 also show how the accuracy of the TSM is affected by the number of input drivers. It is seen that RMSE is approximately doubled when the number of input drivers is scaled up by a factor of two. 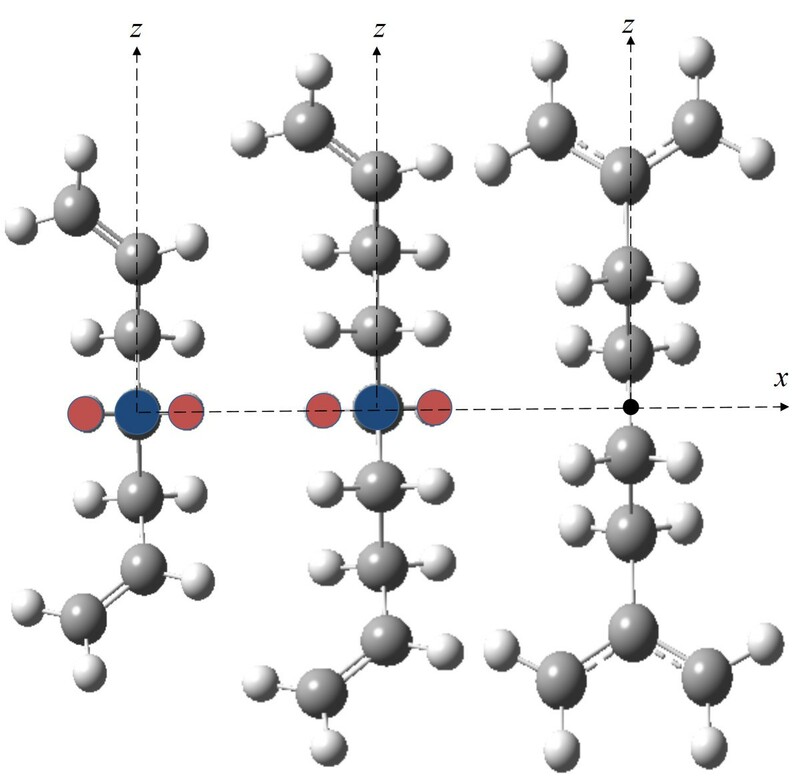 Po(Pd1, Pd2) and Po(Pd1 + Pd2) denote the calculated output polarizations based on the SA/CASSCF method. RMSE has been calculated based on Po(Pd1,Pd2) and Po(Pd1 + Pd2). RMSE * has been calculated based on Po(Pd1, Pd2) and Po*(Pd1 + Pd2) from Table 2. The multidriver MinV gate is a universal gate in the two-dot mQCA. The output polarizations of these gates with three fixed input drivers are shown in Table 4. This table also shows that the output polarizations of the MinV gates can be obtained from extrapolating the INV output polarizations using the additivity relation. For the model molecules, considering the spatial location of the d2, the effect of d2 on the head groups is different from the same effect of d1 and d3, while in the TSM, drivers with equal polarizations have same effects on the head groups and are treated the same. Quantum chemical calculations show that despite the equal sum of the input polarizations, the output polarizations are not equal particularly when the sum of the drivers is zero. Table 4 also displays that the SA/CASSCF method returns different output polarizations, while the sum of the input polarizations is zero. This is the main reason of the decrease in the accuracy of the results obtained from the TSM for MinV gates. Ignoring these points by avoiding the null state logic occurrence, the two-state approximation results are fairly in good agreement with the quantum chemical calculations. Table 2 and Table 4 show how the accuracy of the two-state model is decreased with the number of drivers. It is seen that RMSE is tripled when the number of input drivers is scaled up by a factor of three. Po and Po * denote the calculated output polarizations based on the SA/CASSCF and TSM methods, respectively. RMSE * has been calculated based on Po(Pd1, Pd2, Pd3) and Po*(Pd1 + Pd2 + Pd3). RMSE** has been recalculated when points with Po * = 0 have been omitted. Molecular QCA gates are the building blocks of more complex modules. Probing molecular devices requires quantum chemical calculations, which are challenging as the molecular system grows in size. A semi-classical model was derived directly from the two-state approximation in the ET theory, serving as a device for studying mQCA gates. This model is very similar to the two-state model which is currently the core of the QCADesigner simulation engine for solving circuits based on metallic QCA. The range of applications and limitations of this model for mQCA gates was investigated carefully. The parametric TSM can be used to study more complex mQCA gates composed of practical candidate mixed-valence molecules, where exploiting the SA/CASSCF method is of high computational cost. A complete set of logic gates were implemented within the two-dot mQCA framework. These gates include INV and MinV gates, which provide a small molecular test bench, making further analysis by quantum chemistry methods, particularly SA/CASSCF, practical. The INV gate was studied as a nucleus of all other gates. It was also presented that output polarizations of all other gates can be derived from extrapolating the results obtained from inverters based on the additivity relation. We compared the results obtained from the TSM to those obtained from SA/CASSCF calculations for INV and MinV gates. The degree of agreement between the TSM and quantum chemical calculations is highly dependent on the μ parameter and the symmetry of the head groups. Additionally, application of the additivity relation for CASSCF method can in turn reduce the computational cost. It is important to note that we did not address questions of surface attachment, input/output, clocked control, layout, and patterning, which are the requirements of a practical QCA system. Moreover, we did not consider the relaxation of nuclear degrees of freedom associated with electron transfer. It is presented that for mQCA, the electron localization and Coulombic interactions play the key roles, and nuclear positions can be considered frozen (nuclear relaxation even assists charge localization) . Although we limited our focus on the two-dot mQCA, it merits highlighting that the model can also be used for four-dot cells, since they can be considered as double two-dot cells. Our focus was on the mQCA gates as building blocks of circuits. The two-state model may be applied to simulate mQCA circuits as well, as it is currently used iteratively for simulation of metallic QCA circuits in the QCADesigner. However, to determine the additive error resulting from exploiting the two-state model for solving mQCA circuits, further quantum chemical calculations on the mQCA clocked circuits composed of several molecules are required, which are extremely challenging at the time, and have not been addressed in this paper. ER was affiliated with Norwegian University of Science and Technology. Calculations presented in this work have been carried out on Stallo. ER also thanks Professor Sven Larsson for many enlightening discussions on electron transfer theory at Chalmers University of Technology. ER developed the theories and carried out the quantum chemical calculations. SMN supervised the project. All authors read and approved the final manuscript.